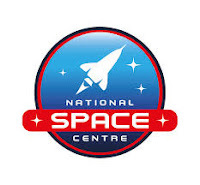 On Sunday 26th March, Cadets and Staff from 84 (Coventry Airport) Squadron took the giant leap to visit the National Space Centre in Leicester. They took along with them a few friends from 163 (Coventry Phoenix) Squadron to share the ride! Cadets were given full access to the museum's exhibits including the simulator and the many interactive games which fill the Leicester based centre. After a lunch break they were tasked with exploring the tower containing the main rockets. Cadet Flight Sergeant Phoebe Jenner and Warrant Officer Nick Raske even posed with Astronaut Tim Peake who kept popping up around the museum! Mrs Jessica Jenner, parent and Civilian Committee Secretary, then had a go at presenting a weather report dated for the year 2025! This was then broadcast live on several TV screens around the exhibits. Whilst the main event was to have some fun and enjoy the day out, the space theme is relevant for many of the cadets' academic subjects including understanding principles of flight, weather and rocketry subjects. We hope they all had a good time and have now come back down to earth without any bumpy landings!